Over the next handful of months I’ll be reading my poetry at a few events in upstate New York, although I may be able to attend some others in NYC and areas beyond if the timing works out. I’m also hoping to set up a few readings on the west coast later this year, so watch this space for more announcements! March 28, Wednesday - Noir at Troy Poetry Mission: Co-host R.m. Engelhardt had the genius thought to hold a themed reading for noir pieces, something we both love, and we’re hoping you will too. Sign-up starts at 7:30 pm at O’Brien’s Public House in Troy, NY, and the reading starts at 8 pm. Have a drink, a mean, sit back, and enjoy the noir poems and stories from local writers, including yours truly. April 20, Friday - Readings Against the End of the World: In mid-April, Albany, NY will celebrate a week of readings and events as part of the annual Word Fest. I will be giving a 10-minute reading as part of the Readings Against the End of the World, a 24-hour read-a-thon to benefit the South End Children’s Cafe. The event will kick off Friday, April 20 at the Husted Hall Café on the UAlbany Downtown campus, and will continue until Saturday, April 21. 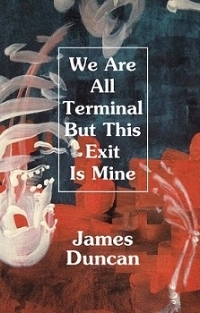 As always, I’ll have copies of my book We Are All Terminal But This Exit Is Mine on hand. May 6, Sunday - DiBiase Poetry Prize Reading: My poem "Strawberry Fields Forever" placed as an Honorable mention in the 2018 Stephen A DiBiase Poetry Contest. So many great writers appeared among the winners that it's an honor to even be mentioned, not to mention the $70 check that helped pay off some medical bills (and maybe bought a whisky or two). Winners and finalists will be giving a reading of their work in a special afternoon event. This will take place on Sunday, May 6 between 1:30 and 3:30 pm at the main branch of the Albany Public Library which is located at 161 Washington Ave. in downtown Albany NY. Again, I’ll have books on hand for anyone interested. July 19, Thursday – Albany Social Justice Center Reading: On what I can only suspect will be a hot Thursday night in upstate New York, I’ll be reading as the feature poet at Albany’s Social Justice Center at 33 Central Ave. There will be an open mic before I get up there, and I’m looking forward to seeing who shows up to read their own work. And again, I’ll have plenty of books on hand. It’s a huge honor to announce that my poem “Strawberry Fields Forever” has placed as an honorable mention in the 2018 Stephen A DiBiase Poetry contest, and I’m joined by a bunch of excellent poets including Martin Willitts Jr. (1st place), Richard Foerster (2nd), Rebecca Schumejda (3rd), Olivia McKee, Mary Panza, Dan Wilcox (all honorable mentions), and others. There will be a reading in May in Albany, NY for winners and finalists and it’ll be open to the public. I’ll post more details soon and I'll be there. My poem, “Strawberry Fields Forever,” is from my book We Are All Terminal But This Exit Is Mine and looks back on a childhood memory of picking strawberries with my mother at a farm that no longer exists, or at least it doesn’t exist the way it did way back when. I miss simpler times like those, and this poem is a nostalgic one for sure. My deepest thanks too the judges and those who organized the contest. You certainly made my day much brighter. My short essay, "I Saw It On The Radio," now appears in the massive new anthology, From Somewhere to Nowhere: The End of The American Dream. This anthology is huge, and filled with fiction, essays, art, and more from artists all over the world, but was organized by a loose yet long-standing poetic collective called The Unbearables, who are based out of NYC. This book was in the works for years and I'm impressed by just how much they fit between the covers. The pieces focus on the experiences and observations on American life during and since 9/11, and its publication was delayed in order to include work that looks at our American life under Donald Trump's administration, capping the collection with a rather intense and anxiety-filled finale. My own piece is simply about my experiences on the morning of 9/11, and how I witnessed the towers fall while listening to live radio and watching it on TV at the same time. I was alone, but in a sense, I was with everyone listening in too, all watching the possibilities of a rather mundane Bush presidency crumble into eternal war and strife. The complexities of our world are not easily laid bare, but this anthology tries its best. Check it out if you can! It's a little on the pricey side, but you really get your bang for your buck. Seriously, it's hefty, you could knock out a burglar with this thing if you needed to. Enjoy!